Here’s a statistic to ponder: in 2017, tech leader Dell noted that, 20-plus years into the internet age, 90% of the world’s data and digital footprint had been created in just the previous two years. The reason behind that stunning growth – which has only accelerated – is the enormous demand for remote computing. Today, internet-connected manufacturing lines, streetlights, thermostats and refrigerators all are pumping data to third-party servers in increasing numbers, boosting requirements for flexibility and scalability in data center design. Remote – or “cloud” – computing has become a huge profit generator for Amazon, Google, Microsoft and others. In 2019, alone, Google is expected to spend $13 billion in new data center construction. With that level of investment, developers now require their facilities be designed to adjust and grow, as demand and equipment technology shift over time. And designing flexibility into cable-management plans plays a central role in such future-proofing efforts. Protection. 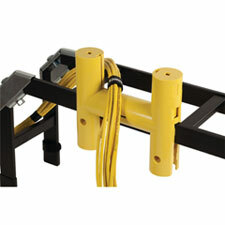 Guides need to protect fiber and cable from being knocked or jostled as nearby equipment is repositioned or adjusted. And any transitions should avoid sharp edges or drops to minimize cable wear and tear. Adaptability. Guides could be repositioned, themselves, multiple times over a data center’s lifetime. They should be designed for attachment to the full array of cable pathways a facility might include. Accessory availability. Having adapters, covers and other accessories to choose from for future moves and changes can ensure the usefulness of cable and fiber guides over the long run.